standing in line for a bus outside the Prado museum in Madrid, a well-dressed man bumped him from behind. When David suggested "There'll be room on the bus for all of us," the man seemed embarrassed and walked off. David stayed in the line – and when he went to pay his fare, realised his wallet was gone. "I'd been pickpocketed by that man. And then came the hours of inconveniences: reporting to police, the credit card company, getting onto the bank….and the feelings of invasion of privacy – and my own stupidity." Unfortunately, too many travellers can relate to these experiences, with professional pickpocket theft on the rise, tourists primary targets. So sometime later when David coincidentally met Bob Arno – who reckons he's the world's only legal pickpocket – he asked him for advice, and got such a fascinating response he offered to share what he learned with us. Swedish-born Arno was, David says, a war photographer in Vietnam when he encountered his first pickpockets, their targets mainly American servicemen and about whose misfortunes Arno wrote several newspaper articles. These exposés caught the attention of the U.S. Military, and when Arno was invited to give lectures on the subject they were so well-received he took his "act" into show business, and with wife Bambi today travels seven months a year with his pick-pocketing lecture-show that's been seen by millions world-wide. Now living in the USA he also works as a security consultant to high-profile business clients, law enforcement agencies and corporations world-wide on how to combat street crime… and never misses an opportunity to film pickpockets and other street thieves in action against unsuspecting tourists. Arno, who dubs himself Professor of Pickpocketry, even sets himself up to be robbed in known pick-pocket hang-outs – so he can make contact and get to understand better both they and their methods, and thus get to know more about the game than many professional pickpockets themselves..
"We lure them into conversation and pick their brains the way they pick their victims pockets," he says. "Most thieves love to brag." And so what's his advice to travellers? "Prepare before you leave home," he says. "Make photocopies of all travel documents, including tickets, passports and itineraries, phone numbers of your credit card companies, your insurer and other important contacts, numbers of your travellers' cheques, and carry them separately from the originals. "Also scan these documents and email them to yourself – so you can internet access them when travelling. "As well, carry three credit cards, each on different accounts, and always leave one with your valuables in the hotel safe... and make sure your room number is not on the hotel key or card, because if you lose either, a thief has your hotel address." Attach two labels to each piece of your luggage with your name, country and email address – but not your home address, which would tell thieves where your home's empty. Put a third label inside your bag. "And very importantly, at airport security checkpoints don't put your valuables on the scanner belt until you are certain you can walk through the metal detector without delay. Be especially wary of someone cutting-in to separate you on one side and your belongings on the other side of the scanner – phones and laptops are commonly stolen this way." Pickpockets, however, are the worst hazard facing tourists. "They'll spill something like ice-cream on you, then helpfully offer to wipe you down – and in doing so dip into your pocket. "Or they'll brush against you in a crowd to feel where your wallet is. Back pockets and loose and gaping front pockets are easy targets – the safest place for valuables is a small pouch that hangs from your belt and inside your pants, or from a string around your neck and under your shirt or blouse," Arno says. "Carry minimum cash and spread it around your pockets and pouch, and if you need to carry passport identification, carry only a photocopy of the relevant pages…. And beware thieves who take-off with laptops in hotel restaurants while you're filling your plate at the buffet." OH so easy: Bob Arno shows how easily it's done during an "accidental" bump in the back. A COUPLE of deft fingers and a wallet sticking carelessly out of a back pocket is gone in seconds. 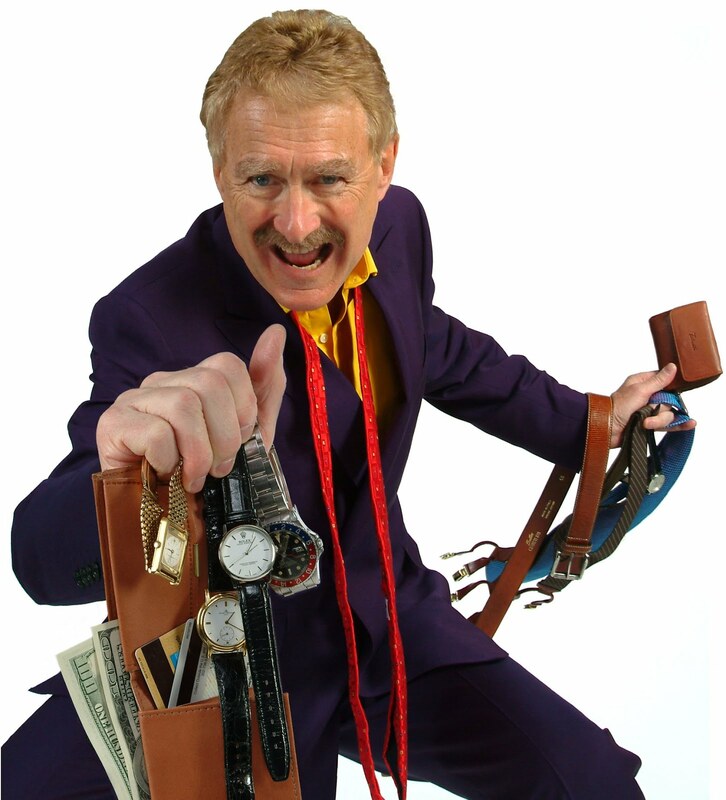 ALL in a day's work – Bob Arno with what a good pickpocket can get away with on a successful day.